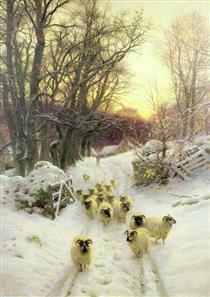 Joseph Farquharson DL RA (4 May 1846 – 15 April 1935) was a Scottish painter, chiefly of landscapes, mostly in Scotland and very often including animals. 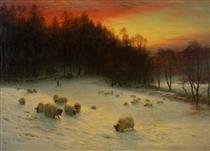 He is most famous for his snowy winter landscapes, often featuring sheep and often depicting dawn or dusk. He was born in Edinburgh, Scotland and died at Finzean, Aberdeenshire, Scotland. Nicknames include "'Frozen Mutton' Farquharson" and "The Painting Laird". 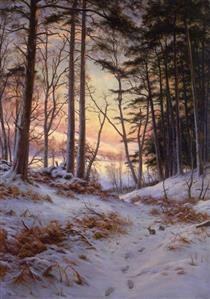 Joseph Farquharson combined a long and prolific career as a painter with his inherited role as a Scottish laird. He painted in both oils and water colours. His mother, a celebrated beauty, was an Ainslie. His early days were spent in his father's house in Northumberland Street below Queen Street Gardens and later at Eaton Terrace beyond the Dean Bridge, Edinburgh and at Finzean, the family estate in the highlands. His father Francis was a doctor and laird of Finzean. Joseph was educated in Edinburgh and permitted by his father to paint only on Saturdays using his father's paint box. When Joseph reached the age of 12, Francis Farquharson bought his son his first paints and only a year later he exhibited his first painting at the Royal Scottish Academy. Farquharson trained at the Trustees' Academy in Edinburgh during the 1860s. 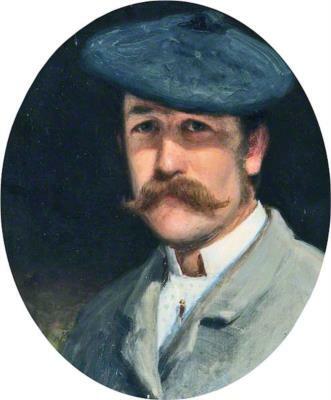 "The Painting Laird" (though he did not yet hold the title of laird) studied first under Peter Graham R.A. and then at the Life School at the Royal Scottish Academy. 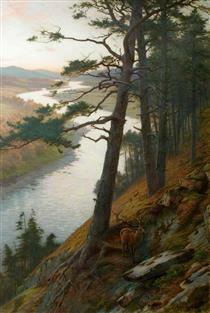 Graham, a popular Scottish Landscape painter, remained a close friend and his influence on Farquharson is unmistakable. 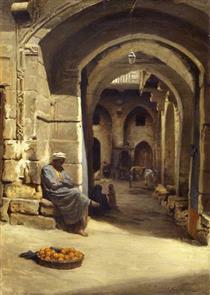 His first exhibit at the Royal Academy, Day's Dying Glow, was in 1873. Much like other leading Aberdeen artists John Philip and William Dyce, he bypassed Edinburgh and Glasgow in favour of London in order to win a wider audience and patrons. His first major portrait, Miss Alice Farquhar, was exhibited in 1884. 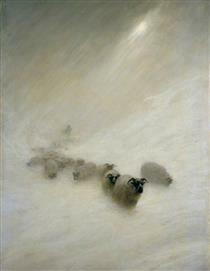 Farquharson is most famous for his works portraying sheep and his finest works often include a human figure. Men and women of Scotland going about their everyday labors are frequently depicted in dramatic landscapes. 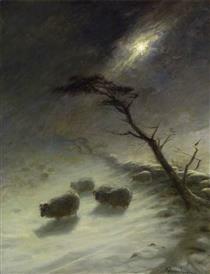 Nearly all the early works were inspired by his rural surroundings and he went on to make snow scenes his trademark. Other subjects he often painted were burns and fly fishing. 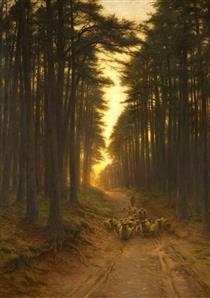 Farquharson was most adept at capturing the warmth and light of sun rises and twilight. The watershed in his career was marked by three or four winters spent from 1880 onwards in Paris. There he studied under Carolus-Duran, an admirer of Velázquez. Carolus-Duran taught his students to use the brush straight away and think in terms of form and colour. As a result, Farquharson's work was always characterized by richly handled paint. Many of his paintings were completed in the north east of Scotland at his beloved Finzean. In 1885 he went to North Africa. Among the works created during the subsequent 8 years were The Egyptian and On the Banks of the Nile outside Cairo. These paintings are excellent but often go forgotten today. 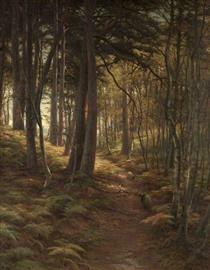 The unusual titles of many of Farquharson's paintings stand out and are sometimes long. Many of them were taken from poems by Burns, Milton, Shakespeare and Gray. Farquharson was very patriotic and well versed in Scottish literature.